The astonishing story of FDR's year-long battle with Churchill as World War II raged in Africa and Italy. 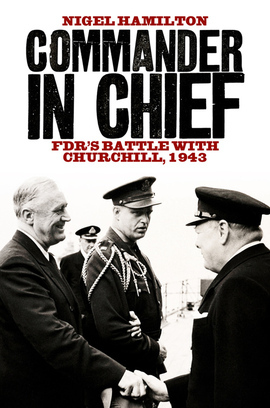 In his masterly Mantle of Command, Nigel Hamilton made a powerful case for Franklin Delano Roosevelt as the brilliant war strategist whose towering importance to the Second World War is overlooked because of his early death. Now, in this second installment of his major trilogy, Hamilton reveals the remarkable truth - suppressed by Winston Churchill in his memoirs - of how Roosevelt battled with Churchill to maintain the strategy that would win the war. Roosevelt knew the Allies should take Sicily but avoid a wider battle in the Mediterranean, building experience but saving strength to invade France in early 1944. Churchill seemed to agree at Casablanca - only to undermine his own generals and the Allied command, testing Roosevelt's patience to the limit. Seeking to avoid the D-Day landings, Churchill made the disastrous decision to push the battle further into southern Europe, almost losing the war for the Allies. In a dramatic showdown, FDR finally set the course for victory by making the ultimate threat. Challenging seven decades of conventional wisdom about not one but two world leaders, Commander in Chief draws on extraordinary new archive material to delve further into the minds and actions of the men who led the Allied powers in the crucial year that decided the outcome of World War II.